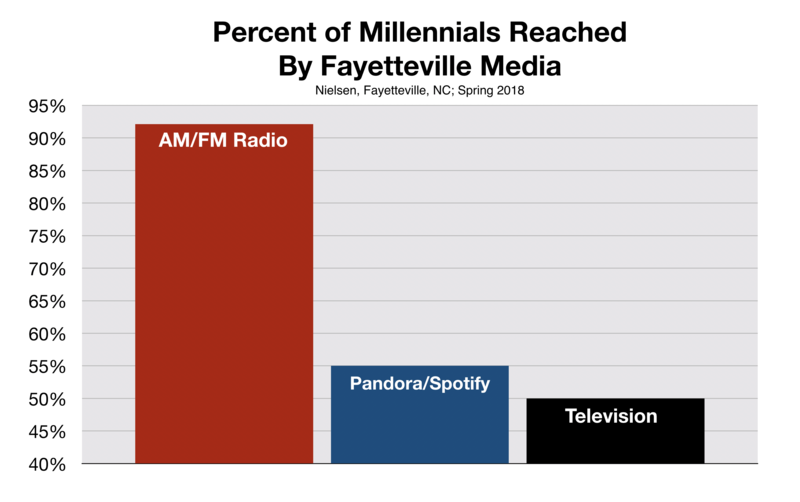 It may surprise many small business owners that Fayetteville radio has a larger reach than Pandora and Spotify even among millennials. Clearly, it is a myth that younger consumers are ditching legacy media in favor of digital options. 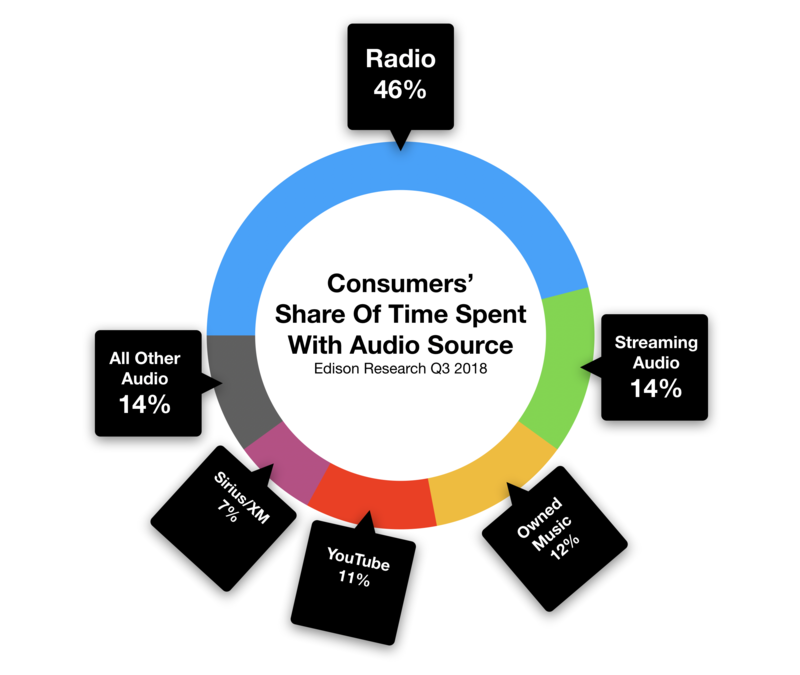 Radio's dominance over audio-streaming sources like Pandora and Spotify is not limited to reach. According to Edison Research, consumers devote 225% more of their time spent with audio, listening to local radio versus streaming sites. According to the eBook "7 Steps For Success", the repetition of an advertiser's message is crucial to achieving top-of-mind status for a Fayetteville small business owner. The more times a consumer spends with a medium, the more efficient it becomes to generate an effective level of frequency. 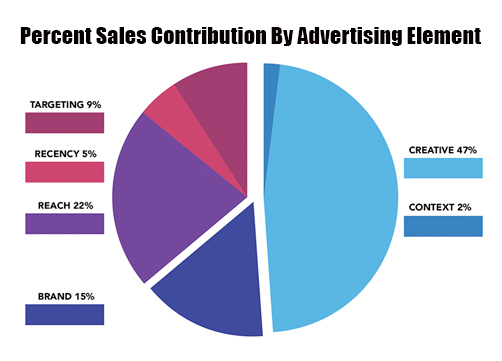 Because consumers spend so little of their time with streaming-audio sites like Pandora and Spotify, it becomes nearly impossible for a Fayetteville business owner to achieve the levels of repetition necessary for an advertising schedule to be effective. 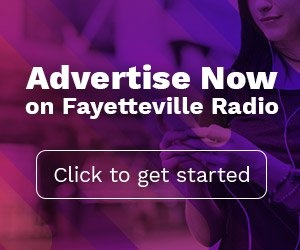 If a business is already advertising on Fayetteville radio, then by default, they are already reaching almost all of of Pandora's and Spotify's audiences. 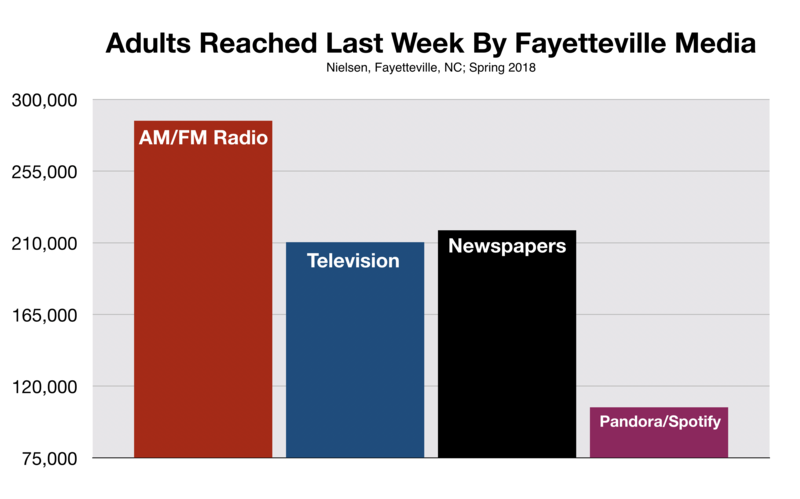 Nielsen reveals that 90% of the combined audience for Pandora and Spotify also listens to Fayetteville radio stations during the course of the week. That number is even higher among millennial consumers. Ninety-four percent of 18-34 year old Pandora and Spotify listeners tune-in to Fayetteville radio stations, as well, during the course of the week. What Do Fayetteville Marketers Think? James Grafstrom, who manages the Crown Complex in Fayetteville, favors advertising on local radio stations over streaming audio sites. Walter White, Vice President of Corporate Communications for Lumbee River Electric Membership Corporation agrees. The company has been advertising non-stop on Fayetteville radio for 16 years. “Everything we do on the radio has the sole purpose of cementing our place as a good corporate citizen in the communities we serve,” he says. “We can’t depend on options like Pandora, Spotify or social media to help with these sorts of endeavors,” he continues, “because they just don’t have the local presence we need to be successful.